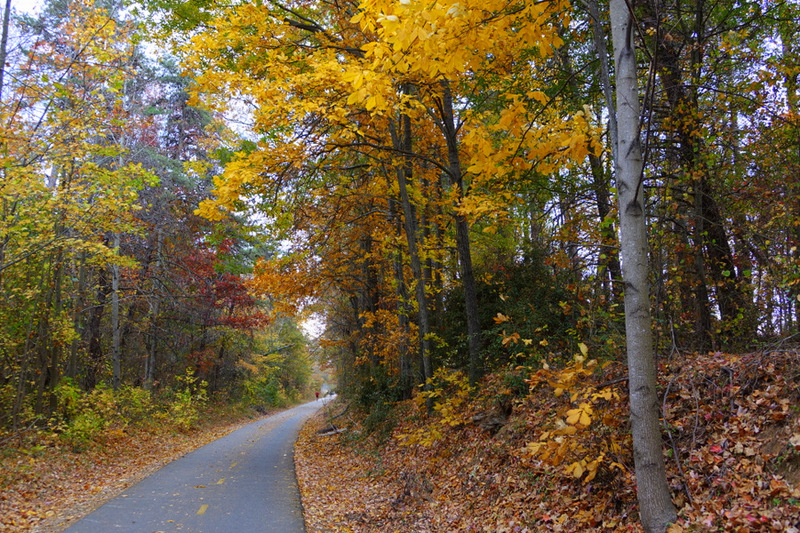 Leaves line the Swamp Rabbit Trail leading to Duncan Chapel Road. 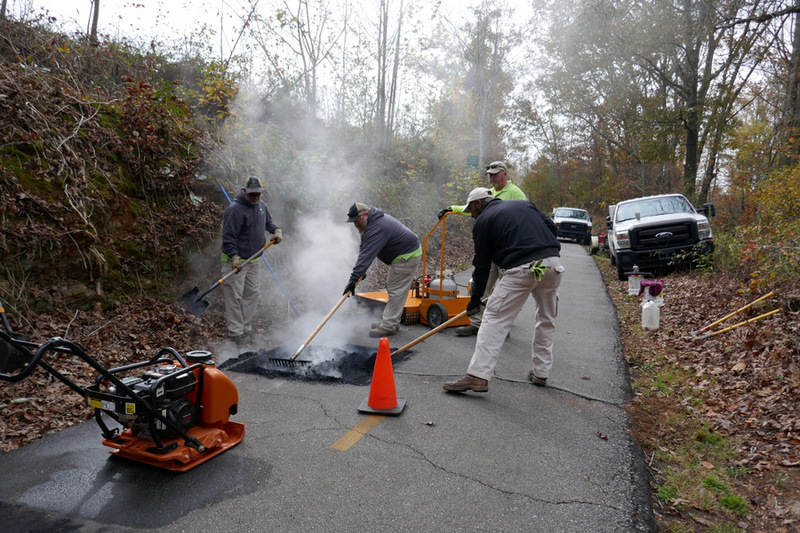 This crew is making a repair to a section of the Swamp Rabbit Trail where there was a tree root or large crack. The process is to heat a section of trail to 1800 degrees, after which the section can be reshaped as smooth as glass. Repairs can be made in cold weather and last year’s repairs are proving to be durable. Not to be outdone by yesterday’s post of “The Hare”, this tortoise (or turtle or terrapin?) 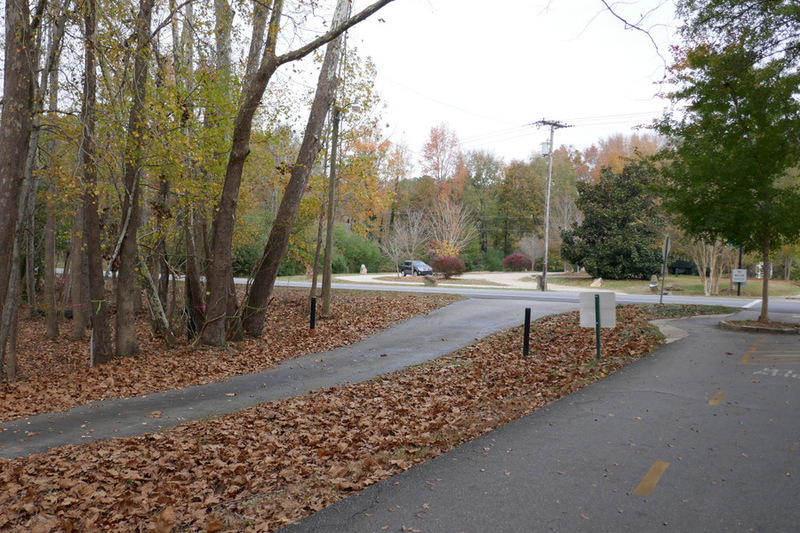 makes a crossing on the Swamp Rabbit Trail. 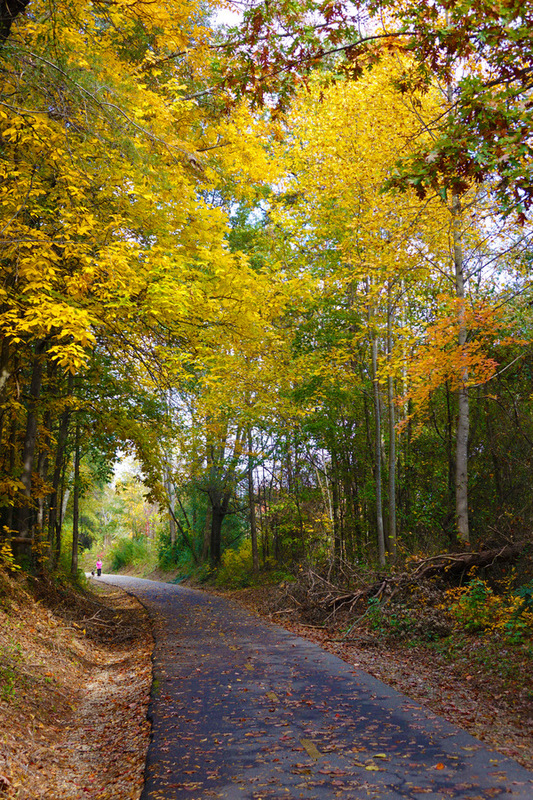 The Swamp Rabbit Trail passes by a section of swamp or wetlands north of Greenville. Along this section there is some unique wildlife along the trail such as frogs. In pioneer days, wetlands were seen as wastelands – something to be drained. But as we have learned, wetlands are an important element in the ecosystem by filtering water, preventing flooding, and a place for the wildlife to flourish. Being a part of Railtex out of San Antonio Texas, we were a proud short line of that company. J. R. And I had just got back from starting up the The Missouri & Northern Arkansas railroad when we found out we acquired the Greenville & Northern railroad (Swamp Rabbit). We enjoyed running The Missouri & Northern Arkansas railroad and pulling those one hundred car trains with the big SD40 locomotives through the Ozark mountains doing 40 mph where we had fourteen tunnels and where you would look two mountains back and see the rear of your train. I remember one day watching an eagle flying over the river along side us as we slowed to 20 mph passing through Branson. So we get back and find out we have a new start up to go look at, we had just acquired the Greenville & Northern railroad (Swamp Rabbit). 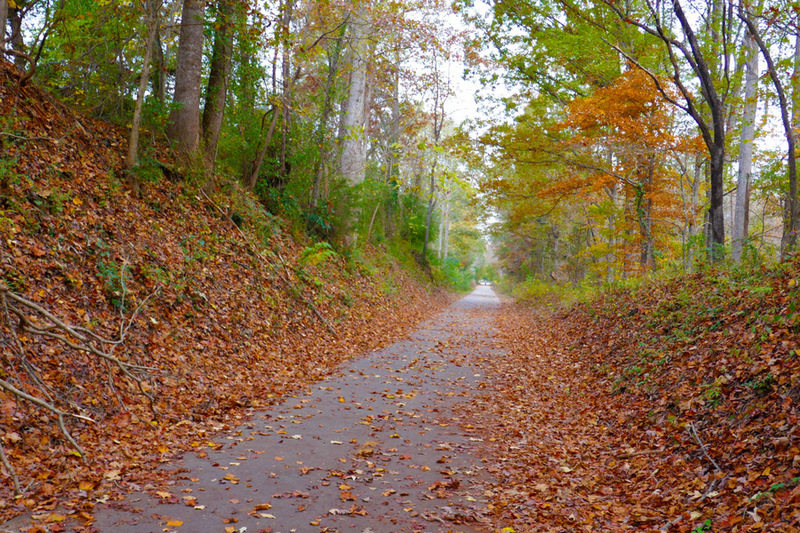 The day we arrived to get the keys to the railroad, we pulled up to the sidetrack off Sulphur Springs Rd. and there set an old GE-70 ton. I said “cool they have a little museum piece here”, JR said “no, that’s the locomotive we’re running today”. One of the first questions I had when I walked up to it was “what are these two fifteen inch notches cut of the cow catcher just above each rail”. It didn’t take long before I found out that and why they called this the Swamp Rabbit! The line needed a lot of work and just before you started up the hill leading up to Furman University we passed a small swamp, that’s where the locomotive would push the ties down into the mud and the rails would slide up into those notches in the cow catcher, keeping the locomotive from derailing. The mud would actually squirt up past the window. You could say we had fun and interesting times running that line but would tell the home office that it is going to cost a lot to repair and maintain this line. One day was the straw when JR. and I started out from the Norfolk Southern yard in Greenville with fifteen cars going to Travelers Rest. Just after we left the NS yard when the twelfth car back derailed. Of course it didn’t travel but about ten feet because we were only doing 5 mph. JR was running that day and it took me about an hour to get it back on the rail and off we go. It was supposed to be a quick four hours run to Travelers Rest from Greenville but it started getting interesting when we had to cross a small wooden bridge just before crossing W Blue Ridge Dr., when the fifteenth car derailed just before the bridge. I tried three times to get it up but I could tell it was not doing the bridge any good shifting the train back and forth so I told JR that we’ll have to get a crane for this one. After a few seconds of silence JR said “ok”. After the train derailed four more times and we were down to seven cars, I said “JR let me take it, you’re not having any luck today”. We were up behind Furman so I put her in notch one and didn’t get but about a hundred yards and it derailed again, JR looked over at me and smiled. Out of the fifteen cars we started with, we pulled up to Travelers Rest with four. It took a week and four cranes to get the line clear. That was one of the deciding moments for the Greenville & Northern. I haven’t had the chance to walk the trail yet, I travel so much but look forward to it soon. These newly planted trees have popped up in bloom during the warm weather. The normally cool winter weather will return by the weekend, so I hope this type of tree will not be damaged by blooming early. Even the bees are out to take advantage of the flowers and warm weather. The bees do not bother trail users because they are so focused on the flowers. The weather changed from a weekend of snow to several days in the upper 70’s the following weekend. So off come the jackets and out come the shorts and short sleeves. A group of pedestrians travel the new trail under the River Street bridge.